HOW MUCH TIME DO WE HAVE BEFORE THE USA AND WORLD ECONOMY TOTAL COLLAPSE? The USA is a constitutional republic "We the people vote to select our leaders and decision makers", period. The legislative branch makes the law, the executive branch carries out the law, and the judiciary branch interprets and enforces the law accordingly to the U.S. constitution. Myself, as a self-made writer it seems to me that there is far too much non-elected one man/woman legislating and making law from the bench now-a-days. The purpose of the 10th amendment was to leave things like wage and price control and abortions up to the states, but the 10th amendment doesn't get any respect since the "New deal" when our welfare state begin. Now, in my view the judiciary branch has become almost as partisan as the legislative branch, which is of great debate lately. FRED THE TENDER HEARTED WRITER'S LOG: 24 NOVEMBER 2018, 0958 HOURS. 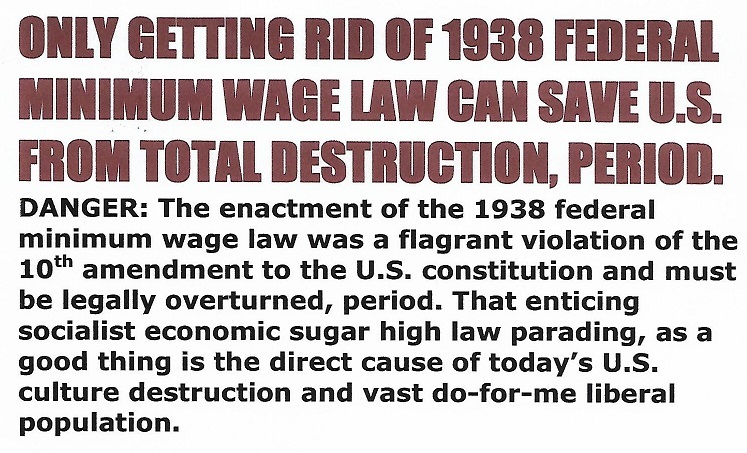 Where was the independent judiciary when the 10th amendment should have blocked our illegal federal arch-evil 1938 socialist minimum wage law, a law that has since left our USA culture along with our nuclear and extended family foundation in total ruins? Now, with no defense within 10 years out of control insane extreme liberalism will force this great nation into authoritarian rule. And if you don't believe me, just keep on living. No one would ever feel they could cheat the life and death cycle. Yet, modern economist and learned eggheads feel they can escape completing an economic bust cycle forever. The life and death cycle and the boom and bust cycle are both laws of nature that must complete its cycle at some point. Sure, man can manipulate wages and prices that can ignite and inflate the currency, which may put off the day reckoning. But, the longer the day of reckoning is put off the harsher the consequences, maybe all the way back to the stone age. The wisest thing to do and is what rulers have done throughout history is just let the free market place work, and then the free market place will stay in balance by setting its own prices and wages. Then above all else let nothing destroy the strong nuclear and extended family foundation, which can withstand any bust cycle with ease. However, nothing else can even come close to even surviving a seven-year cakewalk bust cycle. Now, maybe not today or tomorrow, but the U.S. and the world economy are going to total collapse at some point because it is a law of nature. And right now the U.S. and Western Europe doesn't have a leg to stand on without strong cultures and nuclear family foundations, period. Practically All-free government's income originates directly or indirectly from some form of business profit. The smartest thing the USA should do is repeal the arch-evil 1938 socialist federal minimum wage law, which will start rebuilding our U.S. culture along with our almost non-existence nuclear and extended family foundation. Otherwise, surviving the law of nature coming due over eighty year rebirth bust cycle may set modern civilization all the way back to the Stone Age. FRED THE TENDER HEARTED WRITER'S LOG: 22 NOVEMBER 2018, 1025 HOURS. I take this time to wish all Americans a great thanksgiving 22 November 2018. And please try to accept me in spite of all of my flaws. So many toils and snares I've overcome, but I thank God that I am still standing at age 75 through it all. May the work I've done speak for me. Quitters don't win and winners don't quit. FRED THE TENDER HEARTED WRITER'S LOG: 21 NOVEMBER 2018, 1304 HOURS. No one knows how long we have before the USA and world economy totally collapse? However, I feel it is not as far off as we may think. I hope someone will at least see my writing as food for thought, because my type of thinking you won’t find in a textbook or anywhere, it is creative Sirmans style economics. Still, I feel I must carry on because I believe my country’s survival as a free nation is at stake. I believe beyond a shadow of doubt that it is impossible for the USA to be saved as a free nation unless our federal arch-evil 1938 socialist minimum wage law is repealed, period. I believe the reason the Dems won back control of the U.S. house of representative was because of the health insurance issue, no matter what the experts say. The problem is competing against the dependency welfare state mentality, far too many feel, me first, I won’t mine, I won’t it all, and by the way what have you done for me lately. Plus, never forget we are in the fourth generation as a welfare state. Now we have masses upon masses of die-hard dependent-minded citizens that don’t have a clue as to how a free market place economy really works. These citizens have no concept that mass reckless over spending can collapse our entire U.S. economy, and then the government won’t be able to take care of anyone. These citizens have no concept that if government raises taxes too high businesses won’t be able to make a profit. And if businesses don’t make a profit they can’t stay open to pay their workers, or taxes to the government, then government will go broke and won’t have any money to take care of anyone. So, in survival terms a half of a loaf is always better than nothing. At least the republicans have enough “Common Sense” to make sure the government doesn’t recklessly overspend itself out of existence. But, when has a bleeding heart liberal ever had the self-discipline to resist raising taxes on other people or refusing to start another social program using other people’s money? Never. I am repeating, the only guarantee for a nation or human survival is to maintain a strong culture along with a strong nuclear and extended family foundation. No society has ever survived without the above two basic fundamental survival tools in place and safeguarded. USA and Western Europe's cultures along with their nuclear and extended family foundations are in almost total ruins. In free nations, only a true free market place economy with no minimum wage laws has the muscle and purging power discipline to protect and safeguard said survival tools, period. FRED THE TENDER HEARTED WRITER’S LOG: 15 NOVEMBER 2018, 2340 HOURS.